This was updated 17 FEBRUARY 2010. THOMAS Engineers Ltd has had extensive AUTOMOTIVE INDUSTRY experience in the design and physical testing / evaluation of seat, swivel base, seat-belt and child restraint anchorage frames for many varied applications. While virtually anyone with suitable experience or qualification can design and manufacture seats and seat-belt anchorage systems, the installation of these systems into a vehicle (making it a “modified vehicle”) must ultimately be inspected and certified by a HEAVY VEHICLE SPECIALIST CERTIFIER (HEAVY VEHICLE CERTIFIER) or a LOW VOLUME CERTIFIER for use on roads in New Zealand. Certification is either an LT400 CERTIFICATE or LVV plate in general. All certification is issued by a VEHICLE CERTIFIER. The location of SEATBELT ANCHORAGES (points to which the seat-belt itself is bolted) is important to ensure that the seat-belt ultimately passes effectively over the occupant. The seat-belt anchorages are either attached to the seat itself, in which case the seat becomes a “stressed seat”, or they are attached to the wall or some other structure in the vehicle. In the latter case the seat is an “unstressed seat”. Proper consideration of the load path through seat and seat-belt anchorage points, both for rearward and frontal collisions, is vital to ensure that the seat and seat-belt anchorage system is effectively able to restrain the occupant in the event of a collision. Generally allowance is made to enable some deflection in the system to enable energy absorption resulting from the sudden deceleration. The occupant is therefore not held rigidly in place and less severe injuries are more likely the result. Some seat systems have a “swivel base”, these are typically used in motor-homes to enable the seat to be used during travel and then also, when stationary, as part of a seating arrangement in a lounge for example. Calculation and evaluation is conducted by hand (based on empirical evidence and test results), spreadsheets, Finite Element Analysis and physical testing depending on the complexity of the customer requirement. Seat-belt or seat-belt anchorage certification is required, see also our light vehicle engineering section for detail on low volume and low volume vehicle certification. Always consult a suitably qualified and appropriately appointed certifier before a project is commenced as space around these items is also a vital consideration in system design. All items forming part of the seat / seat-belt / child restraint anchorage system are required to conform to recognised local and international standards. This is important to remember when purchasing seats or seat-belts and related components. Always ask the engineer, designer or certifier to explain aspects of the design that you are not sure of or are indeed interested in. It is important for the certifier to be able to explain all considerations in the design. A “Heavy Vehicle Specialist Certifier” is a person appointed in New Zealand to approve modifications to heavy vehicles : Vehicles with a GVM of more than 3500kg. Load anchorages, their installation and load anchorage certification are a vital means to ensure that loads are restrained effectively to the vehicle. Specifications provide the necessary details to adhere to in the design and certification of load anchorages. Load anchorage installations are required to be certified to a New Zealand standard. Loads are transmitted through the load-anchorages, then through the deck or body of the vehicle and ultimately through the vehicle body mounting points which must be similarly adequately designed and constructed. The number and spacing of load anchorages is an important factor. There may be other aspects which are affected by the implementation or modification of a load anchorage configuration. If you have any queries and before considering any purchases or designs, contact THOMAS Engineers ltd. See our disclaimer. We can provide a range of standard designs for any TOW RATING up to 3500 kg (light). Where necessary SPECIAL PURPOSE requirements can easily and quickly be accommodated in our design office. We can also recommend a range of TOWBAR INSTALLERS depending on your location. We also certify TOWBAR installations on PASSENGER SERVICE VEHICLES (PSVs). For use on vehicles on New Zealand roads, towbars are required to be certified to a New Zealand standard despite the fact that they may have been manufactured to other international standards. The data and criteria from other standards may be utilised by the VEHICLE CERTIFIER in the approval process for New Zealand provided they match or exceed requirements of the relevant New Zealand standards. TOWBAR CERTIFICATION is required for a HEAVY VEHICLE . A "Heavy Vehicle" is a vehicle with a GVM (Gross Vehicle Mass) of MORE THAN 3500 kg. Despite the rating of the tow-bar, the towing vehicle is the limiting factor in the application of a tow rating for a tow-bar. The rating for a tow-bar will include a "braked" and an "un-braked" rating. "Braked and "un-braked" refers to the trailer that is to be towed. We can provide a range of standard designs for all required towed ratings and configurations. Fabricated, pressed or structural frame type DRAWBEAMS. DRAWBEAM RECERTIFICATION subject to strict inspection criteria is also conducted. Recertification depends on the service life of the vehicle as well as the operating conditions. An accurate vehicle history and a CLEAN DRAWBEAM are important for inspection and evaluation purposes. For use on vehicles on New Zealand roads, a DRAWBEAM is required to be certified to a relevant and current New Zealand standard although they may have been manufactured to other international standards. The data and criteria from other standards may be utilised by the certifier in the approval process for New Zealand provided they match or exceed requirements of the relevant New Zealand standards. DRAWBEAM CERTIFICATION is required. Static loads and fatigue loads are considered in the approval and certification of a drawbeam installation, these are considered separately and have different criteria. Despite the rating of the drawbeam, the towing vehicle is the limiting factor in the application of a tow rating. This is established from the Gross Combined Mass (GCM) and the Maximum Towed Mass (MTM) of the towing vehicle. The rating for a drawbeam will be a "braked" rating and generally refers to the trailer. Part of the rating is a "D-value" rating which provides an indication of the mass ratio limits between the towing vehicle and the trailer. We can provide a range of standard designs and DRAWBAR CERTIIFICATION for all required towed ratings. A-frame or Y-frame type applications. We are also able to perform re-certification of draw-bars subject to strict inspection criteria. Re-certification also depends on the service life of the trailer as well as the operating conditions. For use on vehicles on New Zealand roads, draw-bars are required to be certified to a New Zealand standard although they may have been manufactured to other international standards. The data and criteria from other standards may be utilised by the certifier in the approval process for New Zealand provided they match or exceed requirements of the relevant New Zealand standards. Draw-bar certification is required. Static loads and fatigue loads are considered in the approval and certification of a draw-bar installation, these are considered separately and have different criteria. A "Heavy Trailer" is a vehicle with a GVM (Gross Vehicle Mass) of MORE THAN 3500 kg. Despite the rating of the drawbar, the GVM of the trailer is generally the limiting factor in the application of a tow rating. This is established from the Gross Vehicle Mass (GVM) of the trailer. 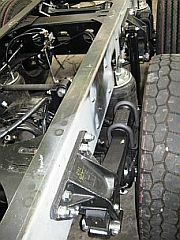 The rating for a drawbar will be a "braked" rating and generally refers to the trailer. There may be other aspects which are affected by the implementation or modification of a towing connection. If you have any queries and before considering any purchases or designs, contact THOMAS Engineers ltd. See our disclaimer. 5th Wheel Couplings (TOWING CONNECTION FOR HEAVY VEHICLE). We can provide a range of standard designs and certification for all required towed ratings. SPECIAL PURPOSE VEHICLE reqquirements including RV TRAILERS & FIFTH WHEEL MOTORHOMES. For use on vehicles on New Zealand roads, 5th Wheel Couplings are required to be certified to a New Zealand standard although they may have been manufactured / installed to other international standards. The data and criteria from other standards may be utilised by the certifier in the approval process for New Zealand provided they match or exceed requirements of the relevant New Zealand standards. Fifth Wheel certification is required. 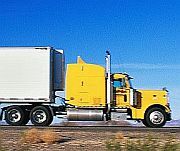 Static loads and fatigue loads are considered in the approval and certification of towing connections. These are considered separately and have different criteria. Despite the rating of the coupling, the GVM and GCM are generally the limiting factors in the application of a rating. This is established from the Gross Vehicle Mass (GVM) and the Gross Combined Mass (GCM) of the vehicle. 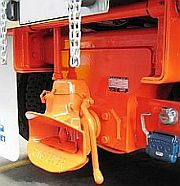 Kingpin Couplings (TOWING CONNECTION for HEAVY TRAILER). We can provide a range of standard designs for all required ratings. Special purpose including imported motor-home configurations (5th-wheelers). For use on vehicles on New Zealand roads, kingpin Couplings are required to be certified to a New Zealand standard although they may have been manufactured / installed to other international standards. The data and criteria from other standards may be utilised by the certifier in the approval process for New Zealand provided they match or exceed requirements of the relevant New Zealand standards. King pin certification is required. 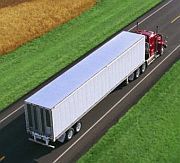 Static loads and fatigue loads are considered in the approval and certification of towing connections, these are considered separately and have different criteria. Despite the rating of the coupling, the GVM is generally the limiting factor in the application of a rating. This is established from the Gross Vehicle Mass (GVM). We can provide full design and certification services for all types of CHASSIS MODIFICATION & CHASSIS REPAIR. WHEELBASE ALTERATIONS (outside of vehicle manufacturer’s limits). SUSPENSION MODIFICATION (outside of vehicle manufacturer’s limits). ENGINE & DRIVETRAIN MODIFICATION (outside of vehicle manufacturer’s limits). SEAT & SEATBELT ANCHORAGE INSTALLATION. BODY, KNUCKLEBOOM CRANE MOUNT, HOIST OR DECK FITMENT..
ANY SPECIAL PURPOSE BODY OR EQUIPMENT MOUNTING. PSV ROLL-OVER AND STABILITY CERTIFICATION. For Heavy Vehicles to be used on New Zealand roads, all structural modifications or changes to a vehicle (outside of manufacturer’s limits) are to be appropriately designed considering appropriate load magnitudes and load paths. These criteria are generally detailed in vehicle manufacturer’s guides and in New Zealand standards. In general data and criteria from other standards may be utilised by the certifier in the approval process for New Zealand provided they match or exceed requirements of the relevant vehicle manufacturer and New Zealand standards. Chassis modification certification is required. Static loads and fatigue loads are considered in the design and certification process of chassis alterations. The results of each are evaluated against particular criteria. Despite the original GVM (Gross Vehicle Mass) rating of the vehicle, it is required to consider load centers and the resulting load carrying capacity of the vehicle after modification. In general, the original load carrying capacity of the vehicle is retained through suitable chassis strengthening practices. We can provide full design and certification services for all types of wheel-base alterations whether by modifying the chassis frame or moving the suspension unit. SPECIAL PURPOSE VEHICLE modifications for particular applications. For Heavy Vehicles to be used on New Zealand roads, all structural modifications or changes to a vehicle are to be appropriately designed and then, once effected, certified by a Heavy Vehicle Specialist certifier. The modification is designed considering the relevant load paths generated under various operating conditions. Various OEMs (Original Equipment Manufacturers) have particular requirements to be adhered to when modifying vehicle chassis. These must be adhered to as first priority in the design process. The data and criteria from other standards may be utilised by the certifier in the approval process for New Zealand provided they match or exceed requirements of the relevant vehicle manufacturer and New Zealand standards. Static loads and fatigue loads are considered in the approval and certification of wheel-base alterations, particularly where the chassis is cut and joined in order to manipulate the wheel-base. We can provide full design and certification services for all requirements in Heavy Vehicle suspension modification outside of vehicle manufacturer’s limits. Standard or typical modifications can be established for vehicle fleets. Special purpose modifications for particular applications. For Heavy Vehicles to be used on New Zealand roads, all substantial suspension modifications to a vehicle are to be appropriately designed and then, once effected, certified by a Heavy Vehicle Specialist certifier. The modification is designed considering the relevant load paths generated under various operating conditions. Various OEMs (Original Equipment Manufacturers) have particular requirements to be adhered to when modifying vehicle chassis. The data and criteria from other standards may be utilised by the certifier in the approval process for New Zealand provided they match or exceed requirements of the relevant vehicle manufacturer and New Zealand standards. Static loads and fatigue loads are considered in the approval and certification of suspension modifications. Suspension modifications may form part of a chassis modification, please see the section on “Chassis Modification” and related items. Despite the original GVM (Gross Vehicle Mass) rating of the vehicle, it is required to consider load centers and the resulting load carrying capacity of the vehicle after modification. In general, the original load carrying capacity of the vehicle is retained through suitable chassis strengthening practices where required. We can provide a full design and VEHICLE CERTIFICATION process for all types and ratings of KNUCKLE BOOM CRANE MOUNT to a Heavy Vehicle. Special purpose KNUCKLE BOOM TRUCK. For Heavy Vehicles to be used on New Zealand roads that have cranes mounted to them, the installation requires, in general, two sets of certification. The first certification is the actual physical design of the components and chassis modifications (if any) to enable the crane to be physically fixed to the vehicle. This is to be performed by a HEAVY VEHICLE SPECIALIST CERTIFIER (VEHICLE CERTIFIER OR HEAVY VEHICLE CERTIFIER). The second type of certification pertains to the stability performance of the completed vehicle (the crane fitted to the vehicle and fully functional). This includes a physical test of the crane ensuring that the vehicle remains stable within the full operating envelope of the fully laden crane. Note that the crane is laden to its manufacturer’s stated maximum capacity. Note that vehicle manufacturer’s and crane manufacturer’s data must be adhered to in the design and manufacturing / installation process. These are clarified and detailed during the design phase. Static loads and dynamic loads are considered in the design and certification of crane mount systems. These are considered separately and have different criteria. Most importantly, the vehicle stability is considered during the design phase to ensure that physical testing later does not yield an unstable vehicle!! Despite the rating of the crane, the GVM is generally the limiting factor in the application, in particular load centers are important to establish. SPECIAL PURPOSE VEHICLE - GOODS (CLASS NA / CLASS NB / CLASS NC). SPECIAL PURPOSE TRAILER - (CLASS TA / CLASS TB / CLASS TC / CLASS TD). AMPHIBIOUS CRAFT / MILITARY VEHICLES. SPECIAL PURPOSE PASSENGER VEHICLE / OMNIBUS. COACH MODIFICATION / MOTORHOME CONVERSION. DISABILITY VEHICLE / DISABILITY ADAPTIVE CONTROL. With a proven track record, we can provide a full range of design and certification services for all requirements in any HEAVY or LIGHT SPECIAL PURPOSE VEHICLE application. Thomas Engineers has been involved in classified projects for extensive VEHICLE COMPONENT DESIGN and is unable to disclose any details prior to product release. For a HEAVY VEHICLE to be used on New Zealand roads, all modified vehicle structural components and assemblies are to be designed and ultimately certified by a HEAVY VEHICLE SPECIALIST CERTIFIER (VEHICLE CERTIFIER or HEAVY VEHICLE CERTIFIER) with the relevant certification categories. In general there is also likely to be a physical test regime developed as is the case in the international automotive industry. From our experience these tests establish the performance characteristics and ensure the vehicle’s suitability for purpose according to specifications. We specialise also in a range of secondary industries that can lend themselves to being mounted to a special vehicle to provide a mobile capacity. In conjunction with leading BODY-BUILDERS and COACHBUILDERS as well as vehicle outfitters we can develop a TURN-KEY VEHICLE SOLUTION for your industry. See also our light vehicle engineering section for low volume vehicle and low volume certification details. Contact us at THOMAS Engineers Ltd to discuss your requirements. Specific loads and load paths are considered in the design and certification of vehicle chassis and special structures which may involve physical testing under various circumstances. A chassis rating is required to be given to a special purpose vehicle in order to define its load carrying capacity based on the limiting factors of its constituent components. These include but are not limited to tyres, brakes, suspension as well as the chassis structure. We can provide full design and certification services for all requirements in Heavy Vehicle brake system modification outside of vehicle manufacturer’s limits. Brake system design for new and special purpose vehicles is also undertaken. For Heavy Vehicles to be used on New Zealand roads, all chassis and vehicle modifications affecting the braking system will require the brake system of the vehicle to be evaluated (and possibly modified) and certified by a Heavy Vehicle Specialist Certifier qualified in the corresponding category. This is in addition to the other vehicle modifications which may be implemented. Specific loads are considered in the approval and certification of brake system modifications and generally involve a physical test under various circumstances. Brake system modifications may form part of a chassis modification, please see the section on “Chassis Modification” and related items. There may be other aspects which are affected by the modification of the brake system. If you have any queries and before considering any purchases or designs, contact Thomas Engineers Ltd. See our disclaimer.